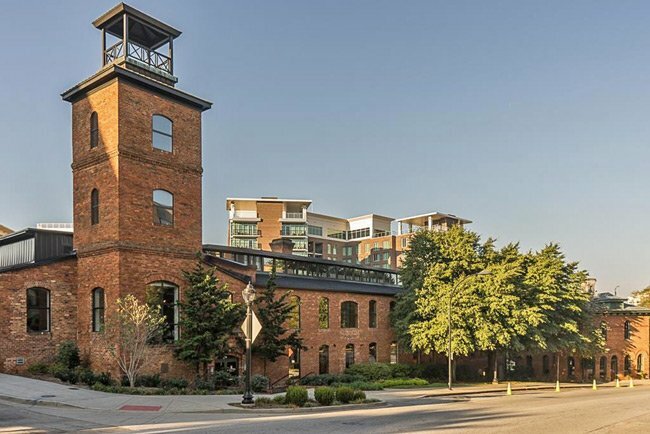 The Peace Center is a world-class performing arts center along the Reedy River in downtown Greenville. It opened in 1990, over a decade after the idea of a local performing arts center was proposed by the Metropolitan Arts Council. In 1985 then-mayor Bill Workman began exploring ways to fund such a center, and in 1986 the Peace family donated $10 million towards the project. Public-private fundraising continued, bringing in the $42 million total needed to complete the project. In 1990 the Peace Center opened for its Founders’ Gala. The Peace Center was built on six acres where four nineteenth century-era buildings once sat in disrepair: A coach factory, a mayonnaise factory, a store, and the Huguenot Textile Mill, seen below. 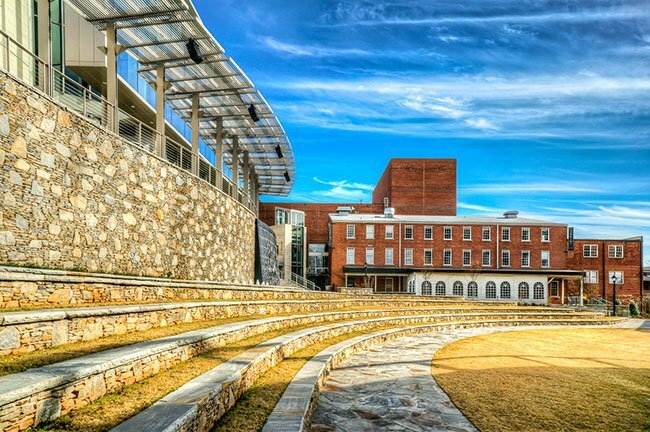 The center’s building team restored the structures and integrated them into the project, which also included two new buildings: The Peace Concert Hall and the Gunter Theatre. The Gunter Theatre was named for Dorothy Hipp Gunter, who donated $3 million towards the building of a 400-seat theater on the site. Between 2009 and 2011, another fundraising campaign took place. This one resulted in the $21.5 million needed to expand the lobby of the concert hall, add a restaurant, and maintain and improve infrastructure. Renovations were completed in 2012. 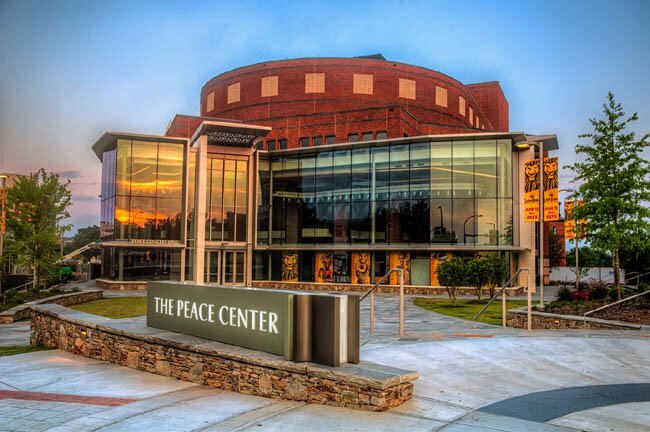 Today the Peace Center hosts around 360,000 people a year for concerts, ballet performances, plays, musicals, and a variety of classes and workshops. 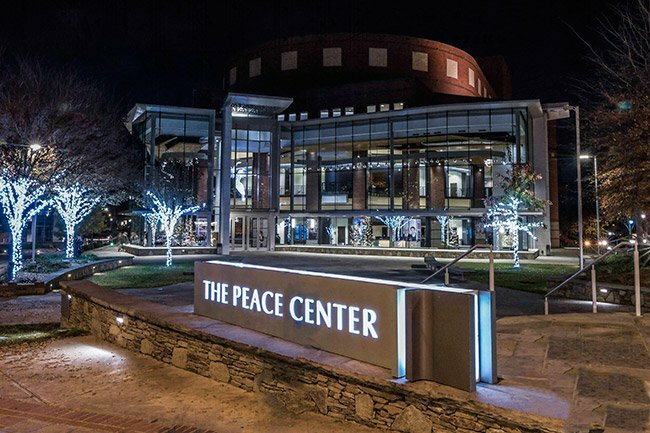 Now a vibrant fixture of downtown Greenville, the Peace Center has brought new life to this part of the Upstate for over 25 years. Michelle, we just sent you an email regarding Charles Hardin’s contact information. I am hoping you can help me reach Charles Hardin of Greer regarding his photo of The Peace Center.